Born Jul 31 18942,3,6,7,8,9,10,11,12 [Jun - 189513], Siler City, Chatham County, North Carolina2,3,6,7,8,9,10,11,12. 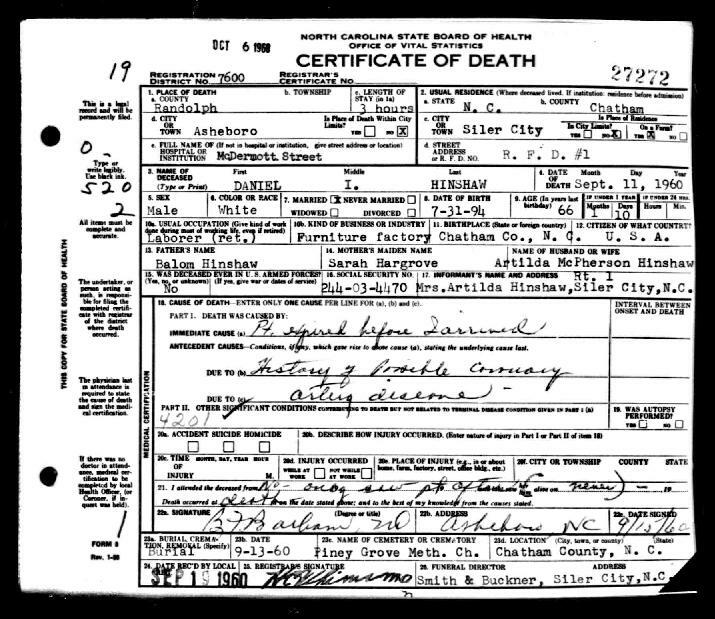 Hinshaw, Daniel I., son, age 5, born June 1895 in North Carolina; parents born in North Carolina. 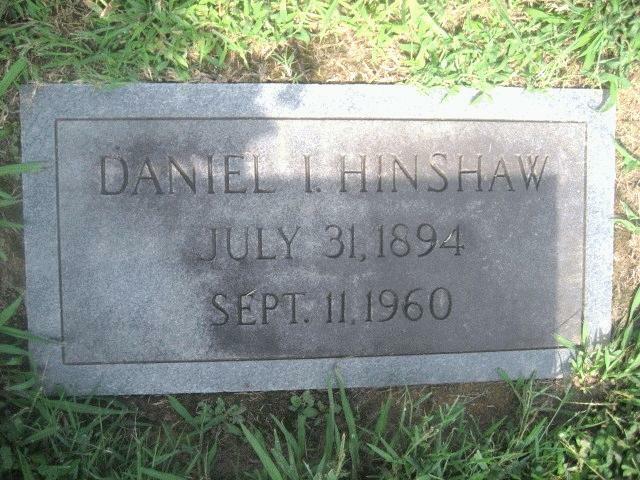 Hinshaw, Daniel, grandson, age 5, born July 1894 in North Carolina; parents born in North Carolina. Hinshaw, Daniel I., grandson, age 15, born in North Carolina; parents born in North Carolina; attended school. Hinshaw, Daniel I., head-of-household, age 25, born in North Carolina; parents born in North Carolina; rented home; occupation: farmer, general farm. Hinshaw, [..unclear..], wife, age 25, born in North Carolina; parents born in North Carolina. Hinshaw, Wilbert W., son, age 5, born in North Carolina; parents born in North Carolina. Hinshaw, Richard M., son, age 3 years 10 months, born in North Carolina; parents born in North Carolina. Hinshaw, Dan, head-of-household, age 35, born in North Carolina; parents born in North Carolina; first married at age 19; rented home ($8 rent); no radio in home; occupation: laborer, chair factory; not a war veteran. 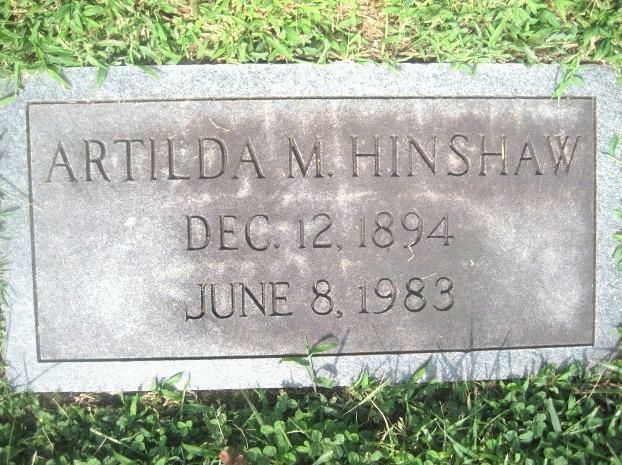 Hinshaw, Artelda, wife, age 35, born in North Carolina; parents born in North Carolina; first married at age 19. Hinshaw, Wilbert W, son, age 15, born in North Carolina; parents born in North Carolina; occupation: laborer, chair factory. Hinshaw, Marven R, son, age 14, born in North Carolina; parents born in North Carolina; attended school. Hinshaw, Margaret, daughter, age 6, born in North Carolina; parents born in North Carolina; attended school. Hinshaw, Daniel I, head-of-household, age 45, born in North Carolina; completed 2 years of high school; on Apr 1 1935 was living in the same place/town; owned farm ($50 value); occupation: bending mill; worked 50 weeks in 1939; $600 wages in 1939. Hinshaw, Artilda, wife, age 45, born in North Carolina; completed 2nd grade; on Apr 1 1935 was living in the same place/town; occupation: housewife. Hinshaw, Margaret, daughter, age 16, born in North Carolina; completed 3 years of high school; on Apr 1 1935 was living in the same place/town; attended school; occupation: public school. 1930 census, Siler City, Matthews Township, Chatham County, North Carolina; roll T626-1681, ED 20, page 8A, line #41, dwelling #142, family #143. 1920 census, Albright Township, Chatham County, North Carolina; roll T625-1289, ED 1, page 1B-2A, line #99, dwelling #26, family #26. Contribution from Rex Isley (). 1940 census, Albright Township, Chatham County, North Carolina; roll T627-2888, ED 19-1, page 9A-9B, line #40, household #149. 1900 census, Albright Township, Chatham County, North Carolina; roll T623-1188, ED 1, page 2B, line #78, dwelling #30, family #30. 1910 census, Albright Township, Chatham County, North Carolina; roll T624-1102, ED 1, page 10A, line #7, dwelling #187, family #188. 1900 census, Hadley Township, Chatham County, North Carolina; roll T623-1188, ED 9, page 10B, line #52, dwelling #192, family #193. "North Carolina Deaths, 1983-87"; http://www.ancestry.com. U.S., Lists of Men Ordered to Report to Local Board for Military Duty, 1917-1918, Select States; http://www.ancestry.com.